The mine launcher is the hardest in the game to use effectively, but the most satisfying to hit with. Due to the nature of shooting mines aggressively, range, and ammo types that affect range, are highly important. 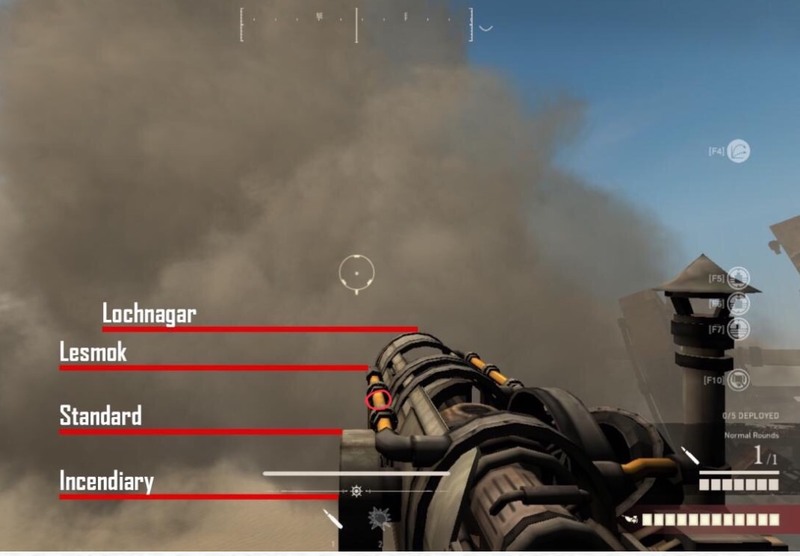 The ammo types I use are Lesmok, normal, incendiary, and lochnagar, in order of arming distance. This gives me 4 separate ranges, not counting ship motion, as explained below. Burst can be used as well, and has the same arming distance and aiming method as normal ammo, with the benefit of extra AOE, but I personally find the utility of other ammo like loch and lesmok outweighs the stronger disable. Because mines arm at a set distance, it is important to estimate range using the map, or, much less commonly, the rangefinder. On the map, each square is 500x500, and the diagonal is approximately 700m. Use this to gauge the distance to the enemy ship. The goal is for mines to arm so that enemy ships hit them. Direct hits do much less damage and do not disable. This is why it is necessary to think ahead to consider where the target might go within the next 3-10 seconds. The exception with direct hits is lochnagar ammo in some circumstances, as it still does 421 damage to armor on direct hit. Therefore, if someone is ramming you, or at point blank, particularly on a munker with a kill side, don't worry too much about point blank direct hits with lochnagar as that will likely soften them enough to go for a kill or make their ram an unwise decision. Be careful with loch mines though, as they will really hurt if your ship runs into a stray one. Conveniently, various parts of the mine launcher serve as indicators as to where the mines will arm. When leading mines, it is important to consider the velocity of both ships, yours, and the target. This is how your ship motion affects arming distance precisely, although these values are for top speed only. Remember that this is only relative to your ship, use target ship as your frame of reference. intending for a mine to deploy in the target ship's direction of travel relative to the world. When leading ships, remember the deploy time is 3s, or 1s with lochnagar. Basically, make a mental note of how far the enemy ship travels in 1s and lead three times that if not using lochnagar. It is also important to try to predict what sort of evasive action the enemy ship will take. Lead a bit more if other ship is slightly inside your arming distance, although this makes mines easier to dodge. Only use these as a starting point for mental estimations, or if you don't have enough time. Remember these are only for top speed, so I personally find it more useful to simply observe their motion and adjust my aim. immediately, like if a shrike is doing a pass with hwacha or some other situation with immediately imminent disable. This image was posted in the GoI discord, and illustrates where mines will arm. For loch, I personally just use the "balloon at crosshair" thing but the tip of the mine launcher works too.